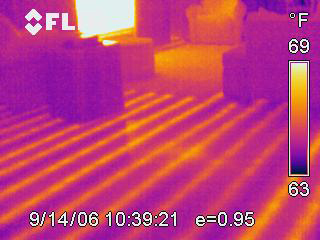 Recently I had the pleasure of seeing how infrared cameras can be used to locate radiant heat tubing in a concrete slab. These infrared cameras are amazing to say the least. We were building a large assisted living facility that had radiant heat in the slab. We needed to drill in some concrete anchors and I wanted to locate the radiant tubes so we did not drill through them. I hired a local home inspector that uses infrared cameras to identify insulation, moisture and radiant heat problems in homes. He was able to show me almost exactly where each tube was. I highly recommend hiring someone like this next time you’re trying to solve any kind of moisture or heat issue. Check out the sample photo and how clear the tube locations are. The only thing I would warn against is making sure you hire someone that has plenty of experience with the camera. After seeing how involved it was I’m sure the technicians experience can make a huge difference in the reliability of the results. Of course you can buy your own infrared cameras for $2,000 from Amazon if want to explore using this technology on a regular basis. Pretty cool! And I thought infra red was only good for ghost hunting. LOL.